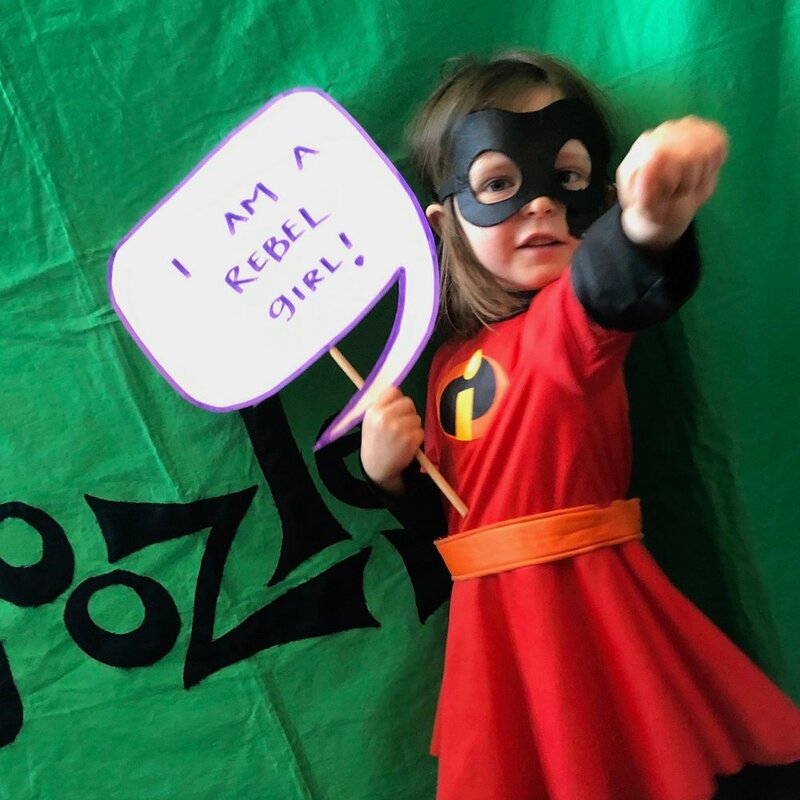 Yes, yes she is a Rebel Girl! Stick with me to the end, this is a good one. Over March break, both girls were excited to head back to the library program we used to attend on a regular basis. I pulled into the parkade and parked in the same spot I always do. As I hopped out of the car I grabbed my parking ticket, thinking to myself, ‘don’t want to lose this again!’ I had misplaced my ticket once before and had to pay a $20 lost ticket fee to get out of the parking lot! I hadn’t had time that day to try and find the ticket because I was en route to pick up a kid from camp. Finally, as I went to walk away from the car with the girls, I patted my pocket for the ticket one last time and it wasn’t there. It wasn’t anywhere. I couldn’t find it. It had vanished into thin air. Not in my coat pockets, not in my bag, not in the kid backpack, not between the seats of the car, not on the ground, not anywhere. The overhead announcement chimed in announcing the children’s program was about to start. We weren’t on time anymore, dammit. I dragged the kids over to the ticket machine at the entrance and buzzed for help. “Hi, yes, I JUST got here and have already lost my parking ticket. Can you issue me a new one so I can get out later?” The crackly voice on the line informed me to press the “lost ticket” button. “But that will cost me $20.” She informed me that was the only way to get out. “Seriously? But I JUST got here. I JUST parked. I need a ticket to get out in 45 minutes.” The lady claimed there was nothing she could do to help but kindly suggested I “take time and look for the ticket.” $#%^@. I kindly informed her that yes, I’d looked. Everywhere. That this was ridiculous and then I huffed away, not wanting to miss anymore time at the program I was now paying $20 for, rather than the $2 fee for parking for one hour. While the girls played, sang and danced around under the guidance of the librarian, I sat crankily texting my husband about the ridiculousness of that system, which I was not trying to cheat. I wasn’t even trying to get out for free. I was willing to pay for my time parked. I knew it wasn’t the library’s fault, nor could they help me since the parkade is managed by an independent company called Indigo. Matt decided to call them and question the absurdity of the situation. After arguing their every point (they actually have no way of reviewing camera footage to see when cars come or go, and she even admitted they can’t see the license plates on the vehicles. So what’s the point of the cameras? ), the woman finally gave in and said someone would call me to meet at the exit to let me out without my ticket. Hurrah! Finally some common sense. Indeed, a parking attendant did meet me at the exit with a new ticket for a total of $2, as it should have been. Yes, it was a bit of a fuss but it was the principal of the matter and well, $20 is $20! Now for the best part of the story. Fast forward to about 5p.m. when we finally arrive home from a busy day about town. The girls run inside and as usual I’m left to carry in all the items accumulated and expanded over the backseat of the car throughout the day. I picked up a discarded rain boot, still left on the car floor from the morning, and there was the parking ticket! It was stuck to the bottom of the boot. I can’t even get mad. I burst out laughing. She was absolutely right.